Can Jacksonville learn anything from a smaller Sunbelt city? Metro Jacksonville's Ennis Davis answers this and more by sharing his experience at last week's Next City 2014 Vanguard Conference. Each year, Philadelphia-based Next City ( @NextCityOrg ) selects 40 of the best and brightest young urban leaders working to improve cities across sectors, which includes urban planning, community development, entrepreneurship, government, transportation, sustainability, design, art and media. Along with alumni, host committee members and Next City staff, these Vanguards convene to collectively learn and think about how to tackle the challenges our cities face. In 2013, I had the honor of being added to Next City's Vanguard. Intersection of MLK Blvd. and Georgia St. in Downtown Chattanooga. 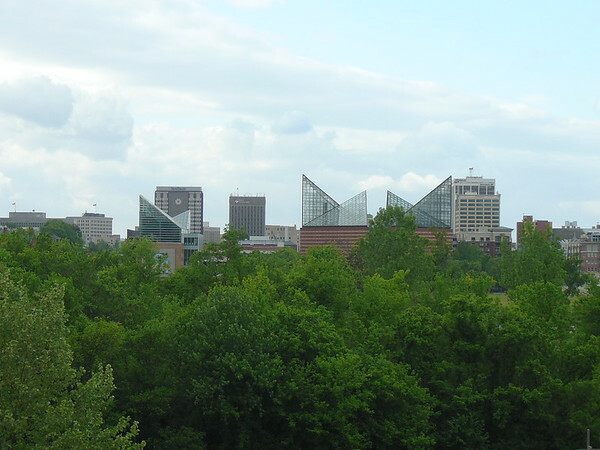 Now an alumni, when Next City announced Chattanooga, Tennessee as the site of the 2014 Vanguard Conference (#vanguard14 ), I immediately booked my hotel for a variety of reasons. For over a decade I've been intrigued by the turnaround of this mid-sized southern city that, in 1969, was labeled as having the worst air pollution of any US city. It's also an example of a former industrialized southern city that has successfully revitalized its urban waterfront—something many of us would like to see continue to happen with our own underutilized waterfront. Furthermore, it was an opportunity to once again form and strengthen friendships and relationships with some of the brightest people this country has to offer. Unlike last year's conference in Cleveland, I didn't arrive early enough to explore the city before the start of the conference. Driving from Jacksonville, I arrived just in time for the conference's opening 50-minute workshops facilitated by 2014 Vanguards, known as Unconference Sessions. Right off the bat, I felt I was in the right place listening to the bike share and bus rapid transit planning experiences of 2014 Vanguards Adrian Lipscombe, City of Austin, Texas' Bicycle Coordinator, Justin Garrett Moore, a Senior Urban Designer with the NYC Department of City Planning and Noah Budnick, a Brooklyn-based Deputy Director with Transportation Alternatives. It was also interesting to learn that Chattanooga already has a successful bike share system, electric shuttle buses serving downtown and, soon, electric car share. 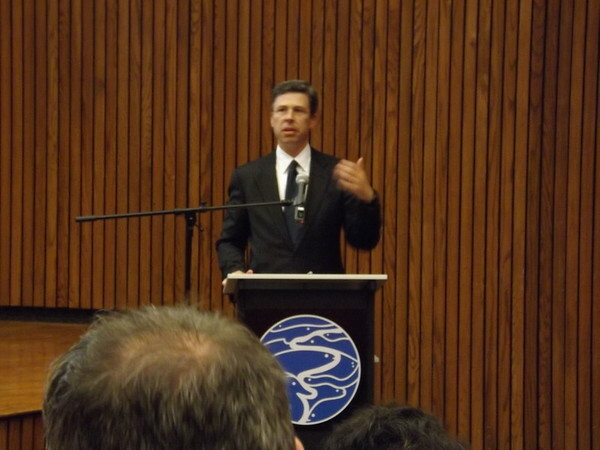 That evening, the Tennessee Aquarium was the site of the conference's Welcome Reception and Opening Remarks. However, before sitting down to listen Chattanooga Mayor Andy Burke share the history of his city's turnaround, I got in a little exercise peddling 2014 Vanguard Cristina Garmendia on one of Art 120's “urban art bikes.” With degrees in Architecture from Washington University and public policy from Harvard, Cristina is the Cofounder of OpportunitySpace. OpportunitySpace is a civic technology start-up that helps governments manage public land to maximize public good. With eight 2013 Vanguards in attendance, the opening ceremony was also a reunion as I reconnected with the friends I first met in Cleveland last June. One of those friends was 2013 Vanguard Adam Rosa. I had to pleasure of having breakfast with Adam and his family during a trip to Chicago, along with a brief tour of Logan Square, a revitalizing neighborhood that offers lessons for Jacksonville neighborhoods like Springfield. The highlight at the Tennessee Aquarium event was the (M)adLib introductions of the 2014 Vanguards, including long time Metro Jacksonville forum member and Transform Jax Co-founder Mike Field. That night, I made plans to go to dinner with a few 2013 Vanguards but ended up getting separated from them and running into and getting to know 2014 Vanguard Marlon Brown, who is a City of Mason, MI councilmember and Budget and Policy Analyst in the Michigan State Budget Office. We then joined the Chattanooga host committee of the 2014 conference and 2010 Vanguards Gary Gaston (Nashville Civic Design Center), William Herbig (National Capital Planning Commission - Washington, DC), Megan Canning (Design Trust for Public Space - NYC) for dinner at St. Johns Restaurant. After dinner, we headed over to Terminal Brewhouse to join up with other Vanguard alumni. 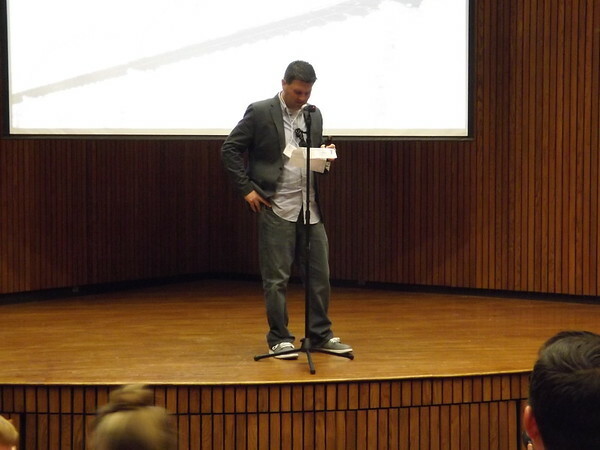 Jacksonville's Mike Field (2014 class) introduces himself during (M)adLibs at the Tennessee Aquarium. My night ended with a good discussion between me, Allison Joe and Patrick McDonnell. A 2013 Vanguard, Allison is a planner for the California Strategic Growth Council/Office of the Governor in Sacramento, GA. Patrick is a 2012 Vanguard from Carrollton, TX. With the success of Metro Jacksonville, I thought I knew a lot about the internet and social media but after conversing with Patrick, an internet and social media guru, I realized I have much more to learn. The next morning, everyone met for breakfast and briefing for one of four different tours of Chattanooga we were asked to select. For the first time in Vanguard’s five-year history, the tours were linked with an ideas competition — the Chattanooga Challenge. 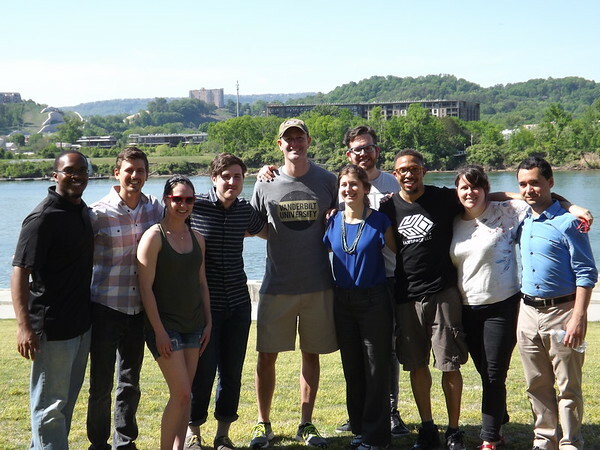 Sponsored by Next City, Footprint Foundation and the Chattanooga-based crowdfunding platform Causeway, the challenge was designed to jump-start civic local innovation through a $10,000 grant for the winning proposal. Each tour group became a team for the challenge. Breakfast was held at the Waterhouse Pavilion at Miller Plaza. This smoke-free city park, stage and pavilion is located in the heart of downtown Chattanooga and is privately owned and operated by the River City Company. It's a space that the Friends of Hemming Plaza should study as they formulate their plans for the management and programming of Jacksonville's historic public square. Walking along Market Street for breakfast at Miller Plaza. From left to right: Stephen Larrick (Director of Planning and Economic Development, City of Central Falls, RI - 2014 class), Noah Budnick (Deputy Director, Transportation Alternatives of Brooklyn, NY - 2014 class), Allison Joe (Deputy Director, California Strategic Growth Council/Office of the Governor, Sacramento, CA - 2013 class) and Patrick McDonnell (Dallas CityDesign Studio, Carrollton, TX - 2012 class). With local downtown revitalization discussion revolving around the riverfront and ideas such as an aquarium being promoted by many Jaxsons, I selected the North tour to experience Chattanooga's vibrant riverfront. This bike tour also resulted in a mini-work out as it included a ride to Stringers Ridge Park, just north of Hill City. Stringers Ridge Park is a 92-acre urban wilderness park that overlooks the Tennessee River and downtown waterfront, two miles south. Tennesseans may refer to this ridge as a hill but to this coastal Florida boy, that rock is a mountain. While we don't have a Stringers Ridge like feature in Jacksonville, we do have our own underutilized urban wilderness of similar size in the form of Exchange Island. 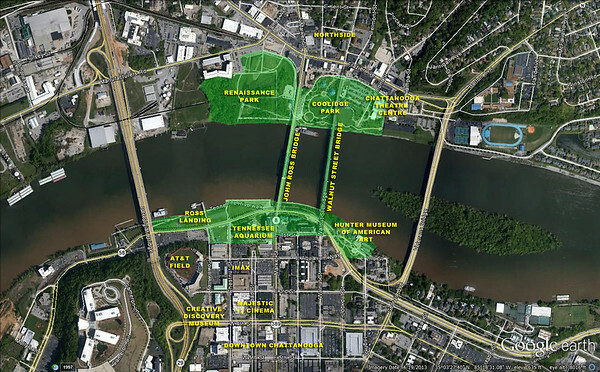 Though many claim individual projects such as the Tennessee Aquarium and the Walnut Street Pedestrian Bridge were the one-trick ponies to turn the waterfront around, what stood out most to me was the visioning, coordinating, and incremental implementation of plans that date as far back as the late 1980s. In Jacksonville, we tend to overlook the importance of coordinating and clustering, complementing uses within a compact pedestrian scale setting, leading to years of isolated developments that fail to provide the vibrancy sold to the public to get them off the ground. 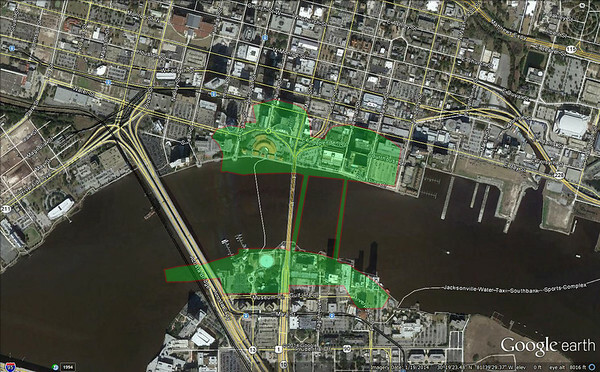 The Chattanooga Riverfront overlayed over Downtown Jacksonville's riverfront. After a morning of tours, the afternoon was highlighted by tour recaps, discussion and workshops on economic mobility, tech in the city, public/private partnerships and thumbing a ride, mobility style at the Chattanooga Public Library. Also considered a working lunch, I got to know 2014 Vanguard Lindsey Scannapieco. Taking her entrepreneurship abroad, Lindsey is a London-based urbanist and founder of Scout, an urban design consultancy with a specialization in the revitalization of underutilized spaces. The night was capped off with a series of stops in Chattanooga's trendy Southside. The stops included happy hour with the National Trust and dinner with Adam Rosa and 2014 Vanguard Jenny Park (Senior Planner, Chattanooga Regional Planning Agency) the at historic Warehouse Row, Pechakucha at the famed Chattanooga Choo Choo with Mike Field and Caron Streibich, and a late night trip back to the Terminal Brewhouse, this time with 2013 Vanguards Allison Joe, Mallory Baches (Urban designer, The Civic Hub-Beaufort, SC) and 2014 Vanguards Juan Gomez (MILPA/The Alliance for Boys and Men of Color, Policy Analyst - Salinas, CA) and Katelyn Wright (Executive Director, Greater Syracuse Land Bank). With the American Planning Association's (APA) National Conference getting underway in Atlanta, the majority of my 2013 Vanguard friends left Chattanooga early to make the drive two hours south. 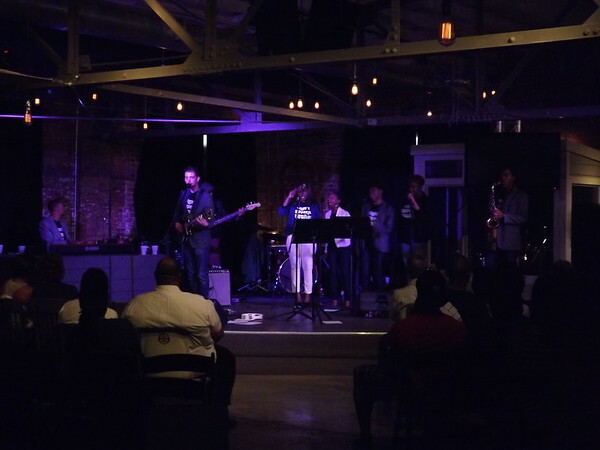 They missed a treat as four groups of 2014 Vanguards put on an impressive show at the Southside's Camp House in their quest to win the Chattanooga Challenge. When it was all said and done, Mike Field's team came in first place with a proposal to provide free Wi-Fi service to a public housing community on the city's west side, along with developing stronger connectivity between the neighborhood and downtown, which happens to be separated by a freeway. Although the 2014 Vanguard Conference concluded with the Chattanooga Challenge, the fun was just beginning. There was a Bible conference underway, the country's largest neo-Nazi group was in town for a rally, Jessie Jackson had made the trip as well, so it was time for me to get my camera and go exploring on my own, on foot. From left to right: Ennis Davis, Peter Smith, Cristina Garmendia, Stephen Larrick, Maury Nicely, Emily Sadigh, David Thomas Moran, William Tate, Julie Ulrich, and Boris Suchkov. I did not make it to the rally but I did run into Emily Sadigh (2010 Vanguard) and 2014 Vanguards Marlon Brown, Christina Garmendia, Stephen Larrick (City of Central Falls, RI Director of Planning and Economic Development) , David Thomas Moran (Geo-social Photographer & Urban Mobile Game Designer - Orlando), Peter Smith (US Social Security Administration Policy Advisor - Baltimore), Boris Suchkov (MTA NYC Transit, Principal Transportation Planner), Julie Ulrich (The Nature Conservancy, Urban Strategies & Watershed Coordinator - Philadelphia) and William Tate (TateSpace, LLC founder - Paterson, NJ). Together, we took a tour of Chattanooga's riverfront with Maury Nicely. After a few hours, we said our goodbyes to Marlon, Cristina, Stephen and David, who left to catch flights back to their home cities. For the rest of us, what was originally supposed to be a two hour walking tour turned into a chain of events ranging from a trip to a Northshore German brewhouse, cardboard rides down steep hills, fraternizing with a magician to outdoor ping pong matches in the dark and a night of live soul and jazz performances in a Southside warehouse. We didn't get much sleep that night but we did form bonds between each other and experience the real Chattanooga and the type of vibrant atmosphere many hope will materialize one day in downtown Jacksonville. Listening to a local jazz band at the Camp House in Chattanooga's Southside. In conclusion, Next City's staff should be commended for coordinating these Vanguard Conferences. Quietly, an international network of community leaders is being assembled that will have the ability to facilitate a more sustainable future for cities across the globe. The trip to Chattanooga was everything I expected and more. There are challenges the community must overcome, such as finding racial harmony, attracting downtown retail and residents as it pushes forward into the 21st century. 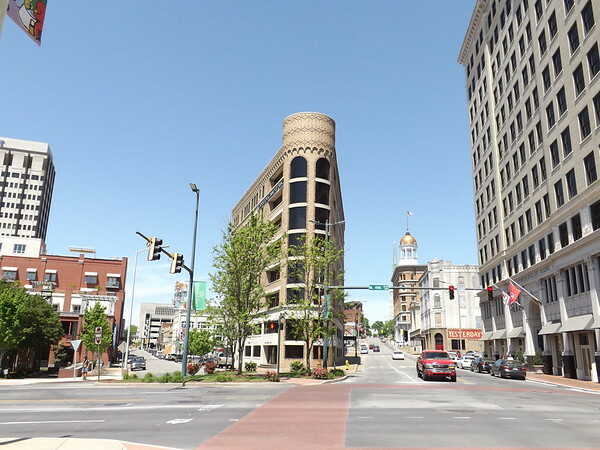 Nevertheless, despite being significantly smaller than Jacksonville, Chattanooga is a great example of a early 20th century industrial sunbelt city discovering a way to turn itself around by taking advantage of its physical and natural assets. 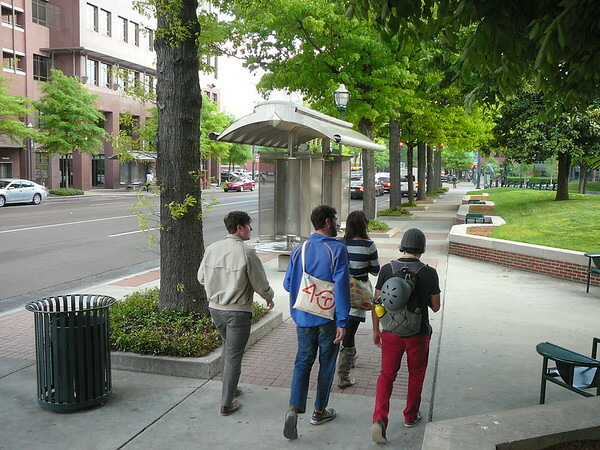 With an abundance of tree lined streets and bike share, Chattanooga has found a way to overcome its many surface parking lots to be walkable and bicycle friendly. Through public/private partnerships, visioning and coordinated implementation, the city has also completely revamped its waterfront, public spaces and streets. What was seen as liabilities in the late 20th century, such as the Walnut Street Bridge, are now attractive destinations that are unique to the city, helping it establish a local identity that can't be replicated in other communities. This is a theme Jaxsons should pay close attention to as ideas continue to materialize on what to do with the future of the Fuller Warren Bridge, the shipyards, old county courthouse and former JEA generation station riverfront sites. Residents enjoying Coolidge Park. 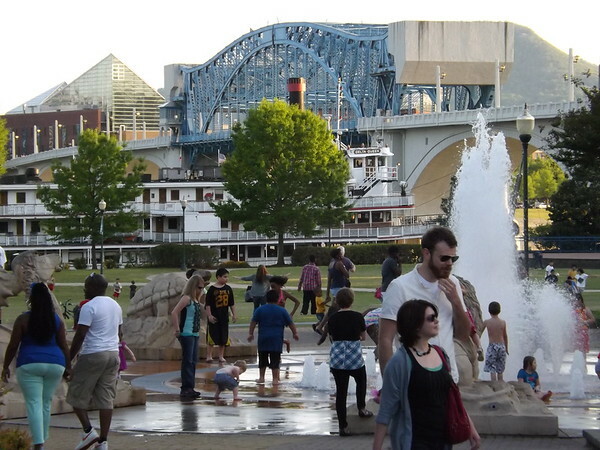 Chattanooga's riverfront offers several lessons for Jacksonville. In addition, forming bonds and relationships with Vanguards from across the country offers exciting possibilities for Metro Jacksonville's future and goal of promoting sustainable growth and quality economic development in Northeast Florida. While we've been successful at engaging the local community to fight against ideas and policies that have a negative impact on our city's future, connections with like-minded, political savvy Vanguards, provide us with an opportunity to expose our local challenges to a world much larger than Northeast Florida. If it takes a village to raise and child, imagine what the possibilities are when your village evolves into a metropolis.